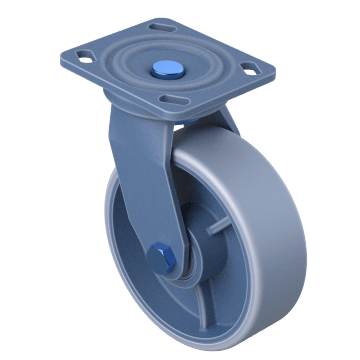 Able to provide a more secure, reliable hold and better distribution of force than stem casters, use these plate casters in demanding applications. Each caster mounts at 4 points using nuts and bolts or screws for a dependable hold on machinery, carts, or other equipment. Move light- to medium-duty loads in industrial and warehouse facilities by attaching these casters to dollies, carts, and other equipment. 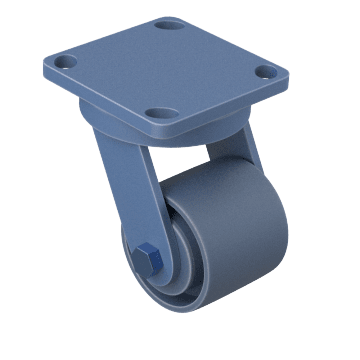 Help keep your equipment moving with these casters with thread guards. 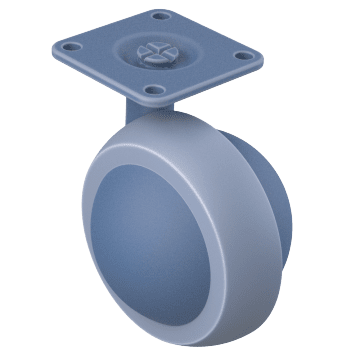 The guard is a nonrotating disc fixed between the caster leg and spanner bushing that forces debris away from the caster's wheel bearing to help keep the wheel free of thread, lint, and other material that could affect the caster's turning action. Replace worn or damaged casters or supply casters for a new application with these kits. They include two swivel plate casters and two rigid plate casters. 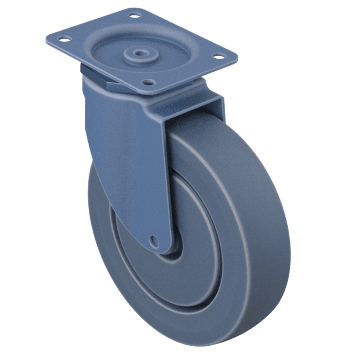 Able to handle frequent washdowns, these casters are NSF listed for use in food service settings, such as in commercial kitchens, restaurants, and food packaging facilities. 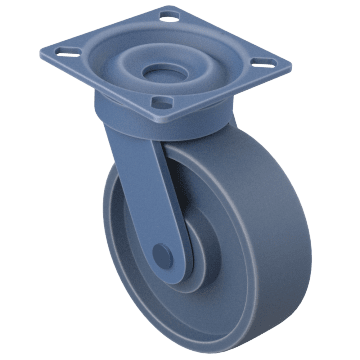 Built to withstand demanding settings that involve frequent washdowns, these NSF-listed casters can be used in food service applications such as packaging facilities, kitchens, and restaurants. 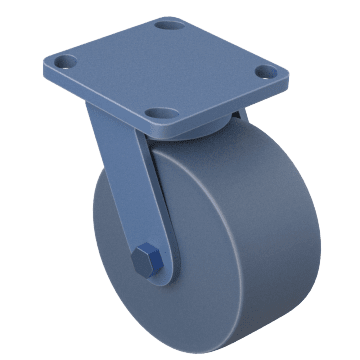 The casters are equipped with a thread guard, which is a nonrotating disc fixed between the caster leg and spanner bushing that forces debris away from the caster's wheel bearing. The guard helps to keep the wheel free of thread, lint, and other material that could inhibit the caster's turning action. For challenging environments involving corrosives, frequent washdowns, steam, or cleaning agents, these NSF-listed casters are made of stainless steel for maximum corrosion resistance. They're commonly used in food service, laundry, pharmaceutical, and institutional settings. 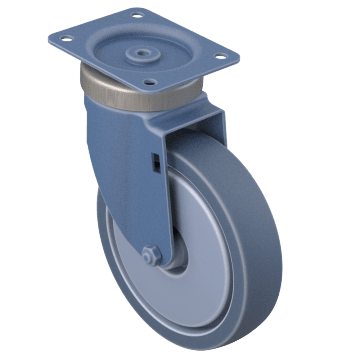 Designed for applications where casters are exposed to high heat and corrosives like steam, water, cleaning agents, and frequent washdowns, these stainless steel casters resist corrosion and have glass-filled nylon wheels to endure high temperatures. They are a good choice for use on bakery racks and in food manufacturing. 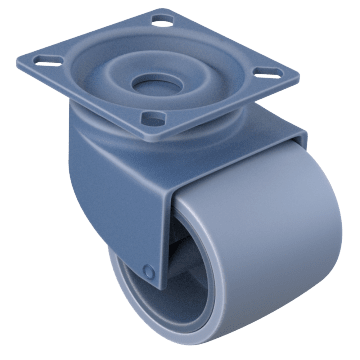 Spend less time on maintenance by installing these casters that have sealed wheel bearings and a sealed swivel mechanism, eliminating the need to add grease during the caster's lifetime. They allow you to move equipment easily thanks to their ergonomic design, which makes them roll efficiently, decreasing strain. 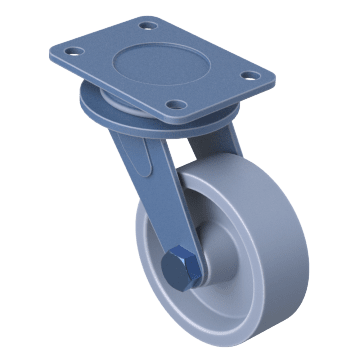 The design of these casters also results in decreased rolling-related noise as compared to non-sealed wheel bearings. The low mounting height of these casters makes them ideal for machines and equipment requiring low ground clearance. 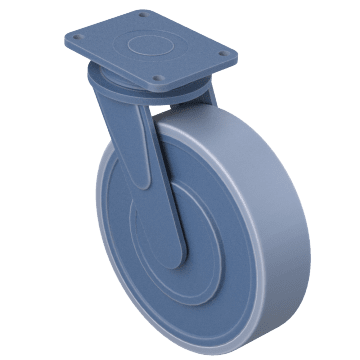 Low profile casters help guard against tipping by keeping the deck of a dolly or cart closer to the ground than standard casters. Dual-wheeled models also have better turning ability than single-wheeled versions. They are commonly used on vending machines, server cabinets, and business equipment. 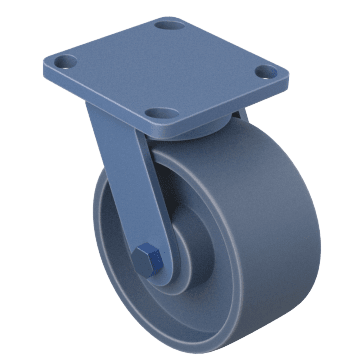 With thread guards to prevent debris accumulation on axles, and quiet, smooth-rolling, nonmarking, ball-bearing wheels, these casters are often used in medical, lab, retail, and food service facilities. Dual-wheeled versions increase turning performance and have lower mounting heights than single-wheeled models. 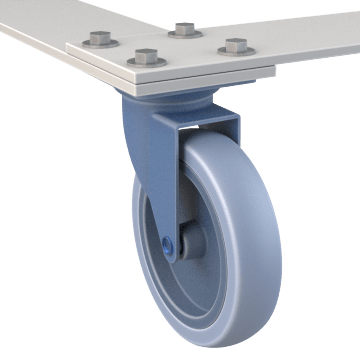 Featuring frames that resist corrosion, thread guards to prevent debris accumulation on axles, ball bearings to ensure quiet and smooth rolling, and wheels with nonmarking tread, these casters are ideal for applications where shock absorption is required as well as durability when in contact with water, chemicals, and other corrosives. They are commonly used in medical, lab, retail, and food service facilities. Dual-wheeled versions increase turning performance and have lower mounting heights than single-wheeled models. 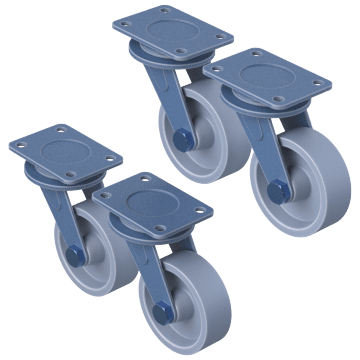 Add these casters with heat-treated, steel frame components to carts, racks, platform trucks, waste disposal containers, and other heavy duty applications in manufacturing, industrial, and shipping settings. They have double-ball swivel bearings for easy rolling and zinc plating to offer light protection against corrosion. 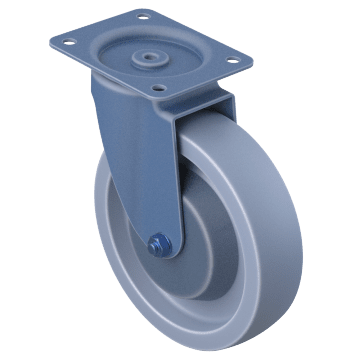 Meant for demanding applications and heavy loads, these casters are constructed of thick, forged steel and feature thrust-resistant bearings and kingpins that have been forged onto mounting plates. Dual-wheeled versions have a lower mounting height and improved turning as compared to single-wheeled versions. Use these corrosion-resistant casters to withstand harsh washdown settings like chemical and pharmaceutical applications. Their stainless steel frames and forged elements make them highly durable, and they have deburred surfaces that are easily cleaned. 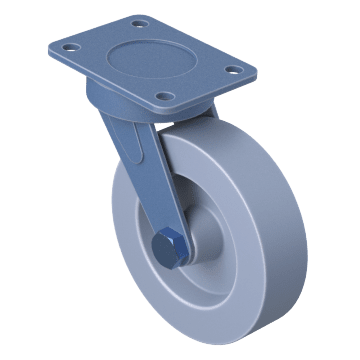 Designed for the toughest environments and heaviest loads, these casters are constructed of thick, forged steel components, thrust-resistant bearings, and kingpins that are forged onto mounting plates. These casters are commonly used in automotive, ship building, and aerospace settings. Dual-wheeled versions have the benefits of improved turning and lower mounting height as compared to single-wheeled versions. 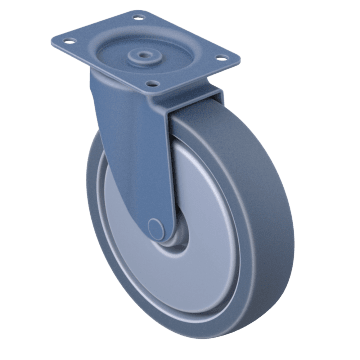 Intended for use in light-duty applications like office chairs, retail fixtures, and other applications that require easy mobility and an attractive appearance, these casters have a ball-style design.